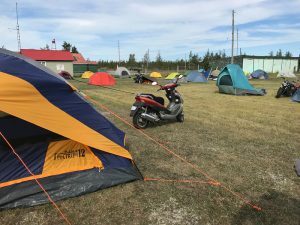 First of all, before the inevitable effigy burnings start – as they tend to really do a number on my lawn – I’d like to say I really *do* like classic scooters. 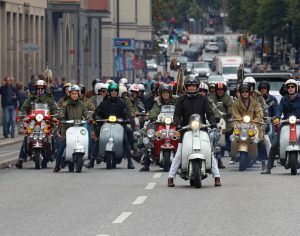 I’ve owned more than one shifty Vespa. I’ve had a part of my brain wanting a Lambretta for years – just not the budget to add one to the stable. 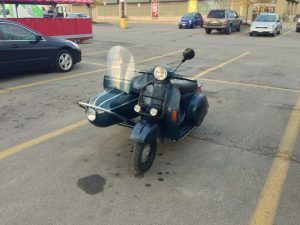 I occasionally stare at pictures of NSU scooters, Heinkels, and the odd Cushman or two. One of the author’s several Vespa scooters owned over several years – a PX125 and Inder sidecar. I’ve offroaded a P-Series Vespa even – and am still impressed how well the machine did in that role. But for various reasons, I’ve come to realize such a machine – if I have one in the stable again and I might well do so again – will be relegated to a secondary machine, suitable for the odd ride and not used as a daily driver. Why you ask? Well you probably didn’t, but I’m going to explain anyways because otherwise this whole opinion piece would be rather embarrassingly short. And really the whole nature of blogs is assuming people on the internet want to know your opinion so I’m just going to assume you are sitting at home urgently pondering this question – so here we go. When we talk about reliabiity – our 2006 Kymco B&W 250 has been the prime example. It’s been abused by a neglectful owner, left outside most of the time, ridden to death and given only the bare minimum of service – yet it keeps on going. require being fixed at the side of the road. It’ll be minor things, like a slipped clutch cable or a clogged jet or something needing to be tightened – but it’ll still need it. 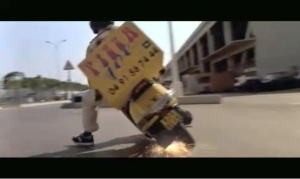 I’ve done the P-series Vespa daily commuter thing – for years in fact – and ruined a few pairs of work pants and was late more than once. 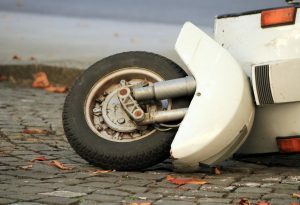 Here in Ontario – it isn’t necessarily easy getting insurance for machines older than 30 years that you plan to ride a lot. (Yes you can get historical insurance, but these quite often limit the amount you can ride the machine – the policy stating you should only ride to events/shows for example – and also are only offered by some insurance companies. Let’s look at at the example of a 1970’s CT90 I went to insure a few years ago. Several companies would not insure it at all – since it was over 35 years old. One company would not insure it because they (for some reason) would not insure bikes between 50 and 100CC’s. CT110? No problem – but the 90 was a no go. The author’s CT90 – a great machine, but it was a pain to insure. After a couple of quotes between 600 and 900, I got an agent to check facility insurance and got a quote in the $400 region. Though I did finally get a quote from Scotialife Financial for $200 per year, and went with them. Due to the age of the machine I did have to get a few extra documents and an appraisal from a dealer to complete the insurance. This isn’t to say others will have the same experience – depending on the machine and insurer it might be an easy and quick process – but generally speaking vintage bikes will be more effort to get legal and on the road. Beyond insurance – the price for buying and maintaining the machine it can also be quite a bit more expensive. Just like with insurance, you *can* do it reasonably if you are prepared to put a lot of work into the machine yourself, and hunt around for an inexpensive project machine to start with. Even our author has to admit, occasionally even his Burgman *does* need to visit the friendly local motorcycle mechanic. But less so than anything vintage he has owned. Parts for example can start to add up quickly if you don’t have something more mainstream like, yet again, the Vespa P-Series. 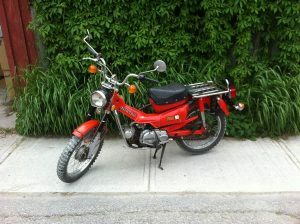 Though the internet makes it easier for the vintage bike owner to find support and the essential bits to make it go vroom-vroom, you are still unlikely to be able to run out and grab something at a local supplier and you will probably be looking at mail order from outside Canada – which can add delays and extra shipping costs. Though given the state of Canada’s smaller market and limited dealers – this can be the situation for many of us without a close-by dealer with parts inventory. But generally for a fairly current model parts will be available within a week or two without the need to order from outside the country. Though to be fair, for some enthusiast driven scooter brands there are local shops and parts vendors who do provide reasonable-priced parts and stock of the same. 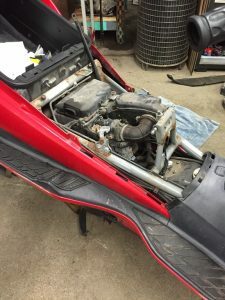 Quite often these are smaller places however with a limit on how much inventory they can carry – so you still might be out of luck when that 40 year old gasket decides to stop sealing things, or the ancient electrics decide to release the magic smoke. Now I have to preface this with the statement that I *do* enjoy the riding experience on a vintage machine. I’ve driven a Ural coast to coast, and you don’t get much more of a vintage tractor-like shifting experience than that. 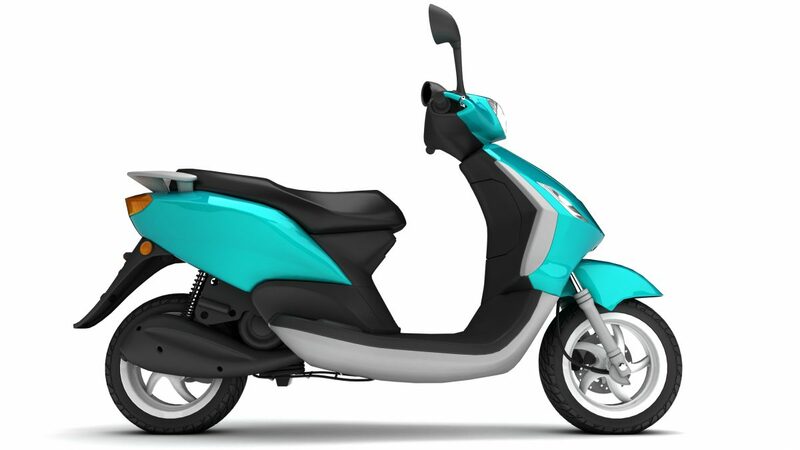 I’ve ridden manual shift machines many times, developed clutch forearms that would make Popeye weep with envy, and I have a sneaking fondness for the way the Vespa P-series will decide to suddenly swap ends when you manage to lock the brakes entirely. Riding these machines takes skills, and an understanding of limits – making you a better rider when you master them. But often it’s nice to just hop on a machine and *ride* the thing. No worries about clutches, blipping the throttle on a two stroke on long downhill sections to make sure you are getting sufficient lubrication, fading drum brakes and iffy ergonomics. The author has had an occasion vintage machine take a street nap due to locked drum brakes and wet conditions. Something that happens less with disc brakes and more modern suspension. Vintage machines have *character* in the same manner as a genteel psycopath – they will charm you, entertain you, and then occasionally get a little stabby when your back is turned. I’ve been on long distance country rides which finished with either a CAA tow truck or duct tape/bailing wire holding some essential piece together until I limped back home. There is something to be said about being able to just be in the moment of the ride, to enjoy what is happening around you – to lose yourself in the journey without having to concentrate mostly on the details of the machine itself. 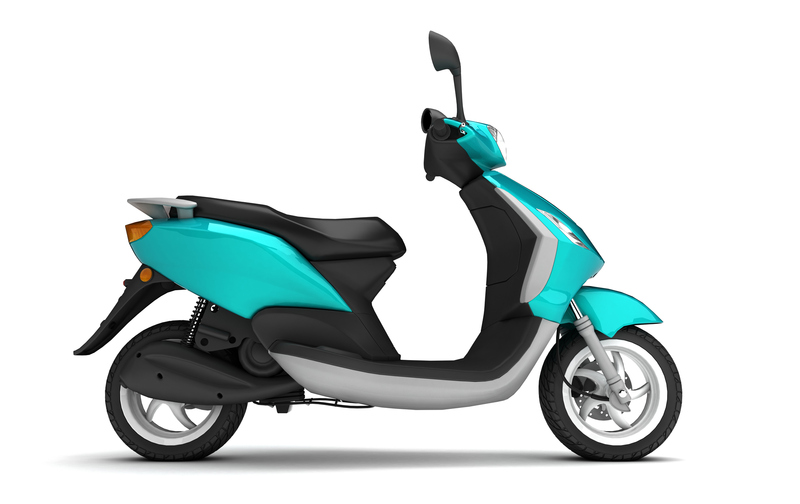 Of course, you always need to pay close attention to your surroundings – motorcycling swiftly becomes suicidal if you don’t – but the modern CVT scooter allows you to spend less time worrying about matching the shifting to the revs and how much braking you can apply before the back wheel locks on you – and more time simply enjoying the experience. Sure you may not have the “classic” scooter, and it may not look like something that you would hang on the wall as art – but I’ve learned one little secret about scooters over the years. While we advocate enjoying the ride, perhaps one should do so less enthusiastically than this. You really don’t see them when you are riding them. I mean sure, you can see them as you walk up to them – and some modern plastic machines are admittedly ugly enough you may wish to do some eye-gouging or blindfolding before you get on the seat – but when you are actually riding you don’t perceive through sight the machine you are riding. Instead you perceive the world around you, the sensations of leaning into a turn, the thrills of experiencing the world through a two wheeled lens. You can enjoy the ride – and the machine is just a conveyance to being able to do that. So it’s safe to say that I like my newer, CVT machines. While I agree the classic curved metal machines will always be more beautiful, I’ve come to appreciate the brutalistic plastic and the reliability and worry free rides that come with something on the modern side. These riders are currently waiting outside the Scoottoronto offices to “discuss” my conclusions with me. So I can say with complete confidence that you should absolutely buy a modern, automatic, low maintenance and easily ridden machine. Because if there is one thing I have learned is that something can be absolutely right – and totally wrong. And frequently, at the exact same time. Keep an eye out for “Why you should buy a Vintage Scooter” in a week or two. Where once again, I prove myself entirely wrong.